Sir Timothy John Berners-Lee, inventor of the World Wide Web, speaking during the opening night of the Web Summit. 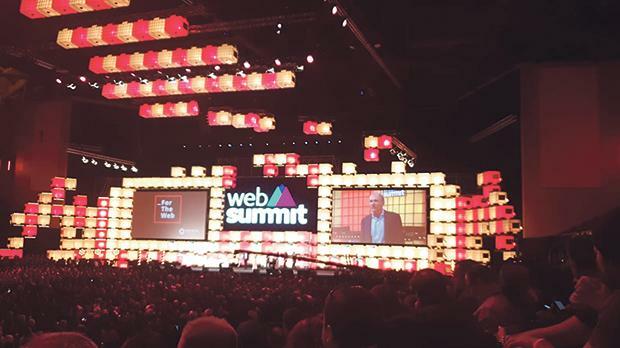 Two managerial members of staff at Frank Salt Real Estate recently attended the world-famous Web Summit in Lisbon, Portugal. Carmen Agius, IT manager and Danica Rosso, marketing manager, were among the 70,000 tech and digital marketing attendees who thronged the arena. Named the “best technology conference on the planet” by Forbes, the Web Summit brings together technology world leaders, startups and policy-makers to discuss and present their vision and predictions for the future of the digital world. The Web Summit, which has grown immensely in popularity since its inception in 2009, has become the definite summit for networking among the world’s leaders and influencers from every industry. In an age of disruption and uncertainty for tech and business, the web summit tackles the challenges faced by businesses today, and through its several panel discussions and presentations, aims to give insight, educate and inspire as to what the future holds for brands, technology, science and environmental sustainability. Frank Salt Real Estate, a forward-looking organisation at the cutting edge of Malta’s real estate industry, recognises that professionals such as Agius in IT and Rosso in marketing, require ongoing training and exposure to new technologies to bring back to Malta and compete in a fast moving and market evolving at a rapid pace, with new technology and practices. They also comprehend that the two functions, IT and marketing, cannot work in silos and there is a clear understanding that marketing and technology have to work hand-in-hand in order to maximise on current brand, marketing and communication trends, new smart technologies and artificial intelligence. Frank Salt Real Estate believes that its people are at the heart of its success. Investing in its people’s professional and personal growth, employer branding and insight into future technologies has led to its success for the past 50 years and the company intends to continue investing in its human resources to provide the best possible service to clients.